Last night the San Jose city council voted unanimously 10-0 to approve rezoning the 95-acre property near Mineta San Jose International Airport to allow development of a professional soccer stadium of up to 18,000 seats for the Quakes. 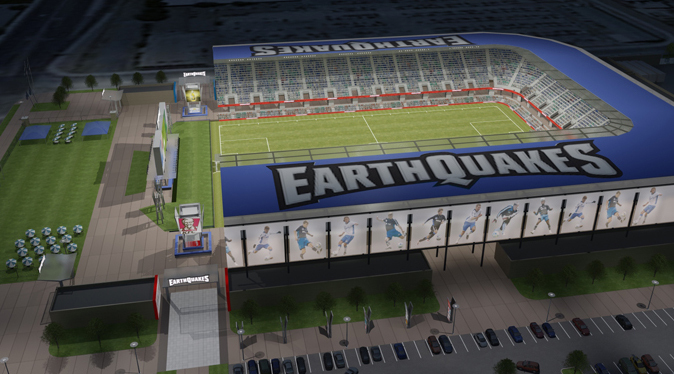 This news out of San Jose is positive but it isn’t a definite meaning that a new stadium for the San Jose Earthquakes will actually be built. But as we’ve seen in Kansas City, small steps usually go a long way in getting a deal done and dirt getting moved on the ground. This is a positive step for the club and the league, which have had so many issues in getting a stadium in the Bay Area over the years. Even if the stadium is as small and without so many bells and whistles that say Red Bull Arena has but it will be a place of their own nonetheless. Quakes owner Lew Wolff will privately fund the stadium build and provide $60 million to help finance the project, and pay the city $7 million for the land near the airport. He is still in the hunt for a major sponsor to help him out in terms of naming rights. The council’s zoning approval will help him out in that area too, companies are more likely to buy into this project now that it has some backing on the government level. We all know the importance for the league to get all the clubs into their own facilities. With Houston and San Jose both close to moving dirt along with Kansas City, the next couple of years could be very promising for the league in terms of being able to work out schedules in their favor, among other things that come with these stadiums. Now if we can only get that team in Washington D.C., a stadium of their own…then we’d be set.